A little bit (or a lot in this case) of snow never holds us back! The unseasonal “Beast from the East” took hold of us in Essex on the run up to Andrea and Paul’s wedding on March 2nd but with the amazing Mr Sticky Fingers Cake Co at the wheel we got their wedding cake to The Arlington Ballroom, Leigh on Sea with no problems. 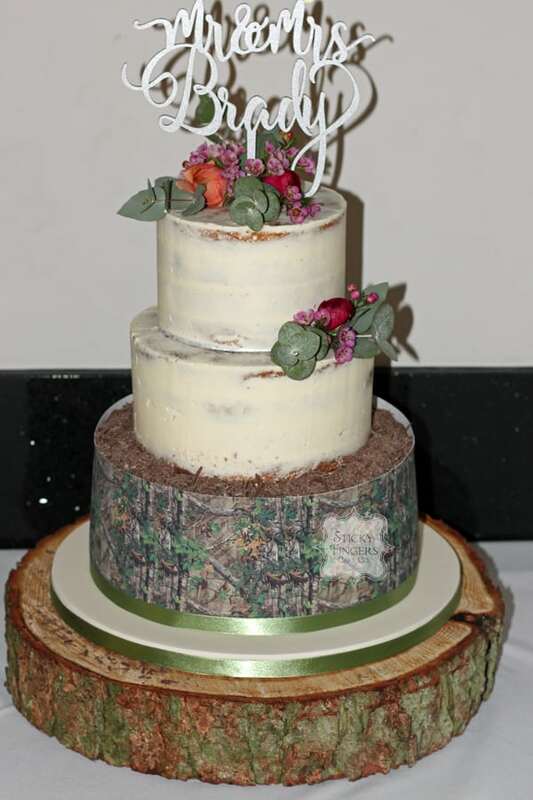 Andrea and Paul’s wedding cake was a three tier part semi naked / part iced with the bottom tier having an edible tree print design around the side and I decorated the semi naked part with fresh flowers supplied by their florist. Super-scrummy flavours of Carrot & Pecan in the bottom tier, then Madagascan Vanilla & Raspberry and finally Lemon Limoncello as the top tier. Hope you had an amazing day (and kept warm!). Wishing you massive congratulations and all the best for the future.